Rajasthan is one of India’s most colorful and historic states. It literally oozes history and culture from grand palaces and forts to ancient and historic temples we cycle through charming towns and villages and visit their markets with wonderful spices and local crafts and jewellery. You will be able to capture the essence of rural Rajasthan as we cycle through tribal villages, visiting ancient temples and passing farmland in the magical kingdom of Marwar. This region has a rich abundance of wildlife and as you travel you will see black buck, antelope, wild boar, and a fabulous array of wild birds and if you are lucky the elusive leopard.There is a back up vehicle to ensure that you will always be looked after each day. 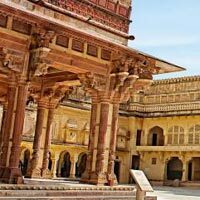 The accommodation on this trip will be in historic houses and castles belonging to the Royal Rajput families where you can relax and meet members of their household. The camps will be in beautiful locations and be well appointed to meet your every need. you can see Faq on web page.